Janel loves the diving here. Vis is great! Dive Journal: We’ve risen early this morning and are headed south from Islamorada with all our dive gear packed into the SUV. We head leisurely down US1 for a pleasant drive through the keys, crossing the many bridges and enjoying the thinning traffic as we head southwest. We’re diving this morning with Florida Keys Reef Divers, Inc. and Captain Jim Wyatt, located on Cudjoe Key. Jim has a nice small boat that guarantees a small dive party. Jim is very welcoming and we’re headed out to Looe Key Marine Reserve in no time. We’re about 5 minutes out from the dock when I suddenly realize I’ve left my video camera behind in the SUV. I consider asking Jim to turn around to get it, but decide it’s really my own stupid fault for forgetting it. Oh well – I will have to forgo the video today, which turns out to be a costly mistake – read on. There are dozens of mooring sites at Looe Key, and about half are filled up this morning. Jim tells us that the reserve will be packed by the time we’re finished with our first dive. The conditions today are ideal. Glass-smooth gin-clear waters. A nice warm surface layer around 87F, about 82F below. At the last minute I decide to ditch the wetsuit and reduce my weight to 6 lb. A good move – I’m much more comfortable during the dive. The reef at Looe Key is a classic “spur-and-groove” reef, like I learned about during my Advanced cert. Jim instructs us to swim up the groove channels, turn around in the sandy shallows , and follow another groove out, working our way up the reef. Since we will stay moored here for both dives, we decide to explore grooves on only the NE side of the boat for the first dive. There are swarms of sergeant majors on entry, a nice welcome. We start up the first sandy groove between reef ridges and find it’s quite nice. Lots of crevices to explore, places for lobsters and eels, and plenty of fish life. At the end of the groove, we pause for a moment, and we are suddenly greeted by a gorgeous manta ray! The 5’ ray gracefully swims across the groove as we all gape in wonder. Linda and I traveled half way around the world to Yap to see manta rays, and here we are in Florida with one only 6 feet away in crystal clear waters! All four of us kneel in the sand and try to hold our bubbles as the manta circles around a bit, then slowly fades off into the distance. A very special treat for all of us, and a first for the children. We explore at least four other grooves and cover a lot of ground. A tank of air goes a long way at only 25 feet. There are numerous eels, including big green morays, goldentail morays, and whitespotted morays. There are some great lobsters, some of them quite big. There are loads of grunts, schoolmasters, doctorfish, and several schools of black margates. Linda was the only one who saw a spotted eagle ray, too. At one point we all look up to observe a school of needlefish on the surface. Near one boulder, a voracious school of midnight parrotfish comes through, diving into a crevice by the boulder to scrape algae. They repeatedly dive into the crevice until sand is flying everywhere. We’re really close to the action and it is just fascinating. 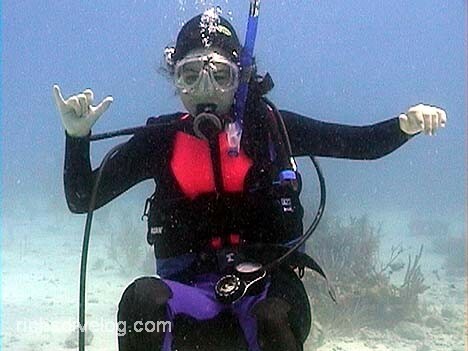 Great dive – Looe Key is a great dive destination.